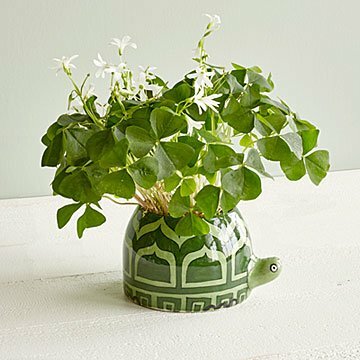 Fill this ceramic turtle with your favorite flower or succulent and in return, he'll fill your heart with joy. We weren't looking for love, but in walked this little guy. Now, we're off the (planter) market for good. Fill this ceramic turtle with your favorite flower or succulent and in return, he'll fill your heart with joy. Artisans in India handcraft the sweet design, forming him from clay, painting his shell, and finishing him with a glossy glaze. This turtle prefers marsh marigolds, trout lilies, and most succulents— any kind of bloom that doesn't require drainage. Ok now's where you come in. Order him so you can take in the cuteness daily. Handmade in India. 3.5" H x 5.5" dia. Most of this little planter looks just like the photo. However, there are no "feet" on the bottom (photo shows little white "feet" to lift it up off the surface you place it on.) There is a drainage hole.